I sat at my desk today and wept. My day at the office was spent writing; today I started on the text for my 108th catalog. I listened to minor league baseball games through the day as my background noise, and at four o’clock — and ten thousand words later — I’d wrapped up work on the first section. I dropped the section off with the Purchasing Department for approvals, then checked Twitter to see what was happening in the world. Long-time readers may know that this is a subject that interests me. I listen to the BBC World Service’s Newshour several times a week, and the story of the Syrian refugee crisis is a frequent news topic. I wrote a little bit about the topic in late November, specifically about how I feel that people are reacting to — and rejecting — Syrian refugees out of fear. I know people who feel, on the subject of Syrian refugees, that the Bruce Wayne Doctrine from Batman v Superman is the only sensible approach — “If there’s a one percent chance that this refugee could become a jihadist in five months or fifty years, we have to take it as an absolute certainty.” I feel differently. The United States was built on refugees who fled their homelands in Europe for the same reason people are fleeing Syria — war, hunger, oppression. The refugees need our love, our help, and our understanding, not our fear and our indifference. UNICEF made three animated shorts using the stories of Syrian refugee children to educate people about their plight. Personal accounts about leaving Syria are matched to imaginative animations that dramatize their experience — the waves of the Mediterranean become sea monsters that threaten to submerge a girl in a boat, the pillow that a girl takes with her becomes her last link to home and her protector, the toys that a boy cherishes become heavier with every step he takes away from home and he finally has to abandon them when they become too big and he becomes too tired. The credits and music convey an upbeat sense of happiness completely at odds with the harrowing stories the animations tell; these could be shorts you’d see on the Cartoon Network, only they enter some truly dark territory made all the darker because they’re true. These short films get at the emotional heart of the Syrian refugee crisis in the way that a segment on Newshour cannot; they use visual metaphors to explore how fleeing their home feels to Syria’s refugee children. The challenges the children face — the loss of family, the loss of home, the real possibility of death, hunger, injury, lack of shelter — are harrowing and horrible. “Some stories are not meant for children,” a title card at the end of each short reads, and that’s true not just because these stories don’t have happy endings. It’s true because children shouldn’t have to worry about drowning in the Mediterranean Sea as they’re looking for someplace safe to live. It’s true because children shouldn’t have to flee their home, their friends, and everything they’ve ever known with only a pillow to protect them or a toy as a companion. I watched all three of UNICEF’s “Unfairy Tales” shorts. 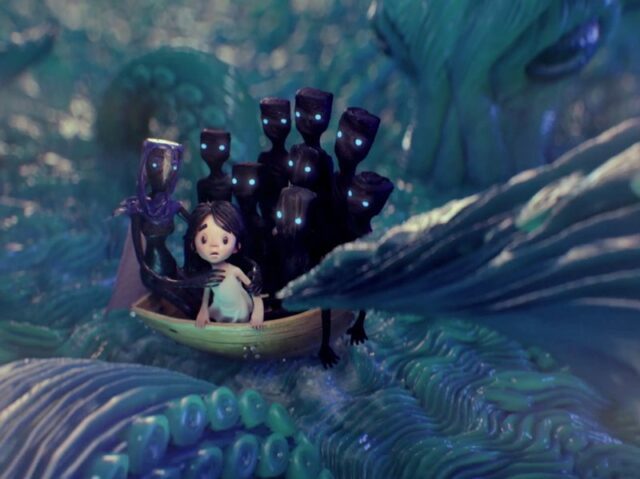 The first I watched was “Malak and the Boat,” and it was devastating. Then, Ivine and Pillow, and I was shattered. Finally, “Mustafa Takes a Walk,” and I was shaken. The animated shorts were beautiful. And powerful. I had tissues. I kept dabbing at my eyes. I thought I was fine fifteen minutes after watching them, and suddenly I started to sob. I had to take my glasses off, and I buried my face in my hands. I was glad I had nothing else to write; I’d have been useless. I should have known better. I’m a sensitive sort. I should have realized that these stood a good chance of ripping through my emotional defenses. As I drove home this evening, alone in the Beetle, I’d find my thoughts drifting back to these videos, and then I’d become emotional. Many things trouble me about the Syrian refugee crisis, from the callousness and indifference around the world to the plight to my own powerlessness to do anything meaningful or substantial to help anyone. The humanitarian disaster in Yemen due to their civil war makes me feel the same way. Sometimes, when I imagine what I’d do if I won the lottery, I imagine giving the money to UNICEF and Doctors Without Borders so they can help the refugees, the sick, and the hungry. They need it more than me. There are things that children should do — laugh and play, love their parents and be loved by them, feel secure, feel safe, feel happy, feel content. They shouldn’t have to fear for their lives. They shouldn’t have to worry about where their next meal will come from or what they’ll do if it starts to rain or gets cold. They shouldn’t have to worry about being alone and without friends. I’ll be thinking about these cartoons for a long time. I was able to watch through your lense. Thank you.